I have only been working in video since the middle of last year. Before that time I mostly painted pictures and wrote stories. These stories, like much of my video work, were written in the first person. 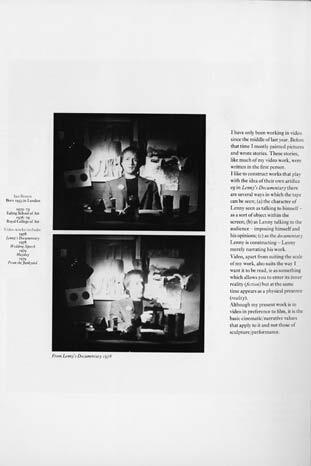 I like to construct works that play with the idea of their own artifice eg in Lenny's Documentary there are several ways in which the tape can be seen; (a) the character of Lenny seen as talking to himself- as a sort of object within the screen; (b) as Lenny talking to the audience -imposing himself and his opinions; (c) as the documentary Lenny is constructing -Lenny merely narrating his work. Video, apart from suiting the scale of my work, also suits the way I want it to be read, ie as something which allows you to enter its inner reality (fiction) but at the same time appears as a physical presence (reality). Although my present work is in video in preference to film, it is the basic cinematic/narrative values that apply to it and not those of sculpture/performance.